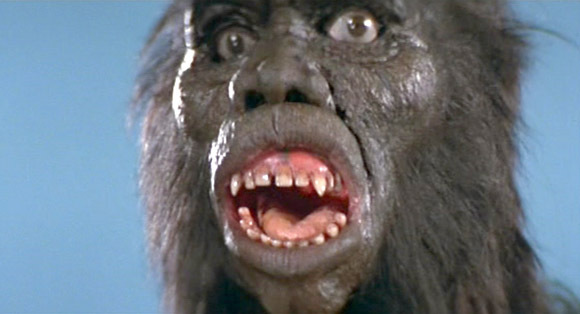 Essential plot rundown: King Kong gets remade Hong Kong style. 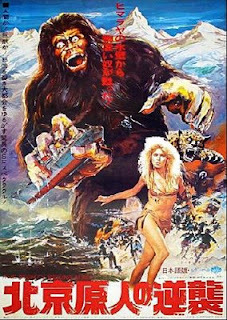 This came out a year after the King Kong remakes starring Jeff Bridges and Jessica Lange. A lot of people get mad when Hollywood remakes foreign films, but hey, they do it to us too. Personally, I love these kind of movies. I am a fan of kaiju films. (I think it's an adjective). They are low budget, they have bad acting and silly story lines, and not very good SFX. But that's ok because they are a lot of fun. 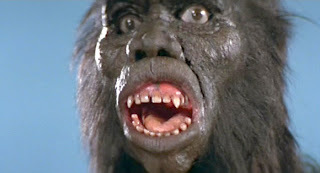 There's not much to say about The Mighty Peking Man other than the fact that it's bad. But, for me, that's the appeal. As far as story, there is a quasi love triangle, but it doesn't add anything to the story and it never goes anywhere. It's just kind of there, existing in the script for some reason. Oh, this movie also doesn't have an ending, which I hate. The gorilla dude falls off of the building and the two lovers stop to look out a giant hole as they are escaping the building which is seconds from exploding. Do they make it out in time? Do they get blown up? Can they see their house from there? The world may never know because it just ends. The woman in this film doesn't really add anything to the story; she's just eye candy. In King Kong, she does something...It's been a while since I've seen it but I'm sure she does something. But, in TMPM, she's just there for gratuitous cleavage. Well, I guess she does contribute one thing. There is a sweet falling-in-love montage between her and the other main character. During the montage, they start playing with a leopard, throwing it around. Is that a normal date activity when courting a woman raised in the jungle? Cuz if so, I'm moving to South America! Actually, that has to be normal jungle activity, because about 15 minutes into the movie, this random guy starts wrestling a tiger! Awesome! Also, elephants go on murderous stampedes and can be gunned down by a pistol. Yea, after watching this movie, I'm definitely moving to the jungle. But I digress. Overall, this is a fun movie if you like low-budget bad movies. If you are looking for something more than entertaining, then I would recommend not touching this movie with a 10 foot pole.